Perambulator, perspicator, lovable scamp, bawd of euphony, DIY jargoneer. Communications, website content and configuration, publicity, social media, advertising, special events for College of Fine and Performing Arts. Yak shaving. Performing arts administrative generalist with detailed skill set in higher education, theatre production and performance. Specialist in marketing, media relations, higher education, nonprofit board relations and governance, nonprofit capital structure, management and operations, including Actors' Equity Association contract negotiation (SPT contract level.) Proficiency with small and emerging performing arts organizations, organizations in financial difficulty, higher education, periodic and run-on sentences. Chris Casquilho is an arts advocate. He attended The University of Montana wearing khakis and a sweater; he read books and wrote papers thinking they would eventually give him an English degree. Thanks largely to the Missoula Children’s Theatre, he fell in with a bunch of well-meaning theatre types, which lead naturally to performing vaudeville; teaching children’s theatre; collecting a Theatre major from the university to add to his major collection; designing and building sets, props, and costumes; selling tickets; making newsletters; editing websites; managing venues; and producing plays (often simultaneously) in such varied places as: Virginia City, Montana; Chicago; New York (City and otherwise); Allentown, PA; Utah; and the Adirondacks. In his support of the arts, he has learned to braze copper, ghost-ride Model-A Fords out of moving trucks, and trap live raccoons. He has shared elevators in silence with Amanda Peet and Sam Shepard (separately); exchanged casual swear words with Tim Roth; and had a brief chat with James Lipton after nearly squashing Lipton's foot with a road case. Once, while waiting in a loading dock, he met Sting. Another time, in the loading dock of the Metropolitan Museum of Art, he knocked over a stack of art crates, but they turned out to be empty. He has portrayed a dead (poisoned/shot/blunt force trauma) or nearly-dead (starved) person on stage four times in two different states. He was the invisible pilot of a magical flying bed in a production of A CHRISTMAS CAROL. 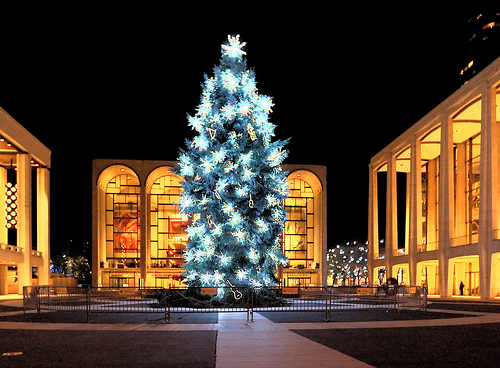 In 2004, he decorated the top half of the Lincoln Center Plaza Christmas tree. Chris currently resides in Bellingham, WA where he shills for the College of Fine and Performing Arts at Western Washington University. BA (English & Theatre), The University of Montana; work history includes Weber State University (Director, Browning Center), The Depot Theatre, Inc. (Managing Director), Crazy Mountain Productions (Executive Director, Development Director), freelance production management (New York), technical direction (New York, SUNY Potsdam, Civic Theatre of Allentown, Virginia City Players), Missoula Children's Theatre (Instructor, children's theatre), paralegal (Chicago), writing instructor (Columbia College Chicago, Southern Arkansas University). Social media training/presenter Theatre Communications Group National Conference, Emerging Upstate Arts Professionals, LARAC.